My breakfast is always changing. Sometimes I’m just not hungry and will have a vanilla bulletproof coffee, or I’ll go all out with eggs and avocado, but in the summer months it’s a creamy and cooling breakfast smoothie that I gravitate to more often. I see SO MANY smoothies out there that are like – 1 banana, half a mango, handful blueberries, spinach. I get it, I’ve been there and they can super yum and sweet, but they always left me hungry not long after and made me reach for a morning snack. Not to mention that it was spiking my insulin in the morning and got me on that blood sugar roller coaster for the rest of the day. No thanks. I now focus on making my smoothies ultra nourishing, with a healthy dose of fats to keep me going, protein and fibre to keep me full and satisfied, and some greens for that extra healthy oomph. Sometimes I’ll throw in a small handful of frozen berries or frozen cauliflower, but for this one I thought I’d keep it simple. 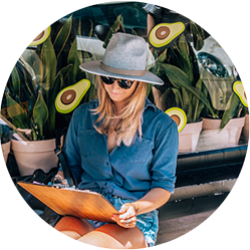 Whenever I make a smoothie now I take Nutritionist Kelly LeVeque‘s tips on creating a Fab4 Smoothie – fats, protein, fibre and greens. It squashes my hunger, keeps me feeling full and satisfied until lunchtime, and gives me long lasting energy instead of crashing and burning a couple hours later. Place all the ingredients into a blender and blend until smooth and creamy! Hey Buddy!, I found this information for you: "Fruit-Free Hunger Squashing Breakfast Smoothie". Here is the website link: https://www.sprinkleofgreen.com/fruit-free-hunger-squashing-breakfast-smoothie. Thank you.